UPDATED: Mon., Jan. 30, 2017, 10:17 p.m.
BYU was one of the last obstacles in Gonzaga’s rise to No. 1 in 2013. The Cougars will be the first test Thursday for the current Zags as they try to retain their No. 1 ranking – and first place in the WCC, for that matter. Gonzaga (22-0, 10-0 WCC) holds a one-game lead over Saint Mary’s (19-2, 9-1) with third-place BYU (16-7, 7-3) trying to make up ground on the leaders. It’ll be the first time BYU has entertained a No. 1 team. A full house is expected at the Marriott Center, which seats 19,000 after renovations last year, down from 20,900. “That atmosphere is unreal,” Gonzaga sophomore guard Josh Perkins said. “They really support BYU and they have a lot of great guys on that team. It’s one of the toughest atmospheres I’ve played in. Then-No. 2 Gonzaga was 27-2 and received help in the form of No. 1 Indiana’s loss to Minnesota and Virginia’s upset of No. 3 Duke when it faced the Cougars in late February 2013. The Zags led by 11 in the second half but BYU rallied to tie it at 60. Elias Harris and Kelly Olynyk made clutch baskets, and Harris and Kevin Pangos drained key free throws as the Zags won 70-65. Gonzaga thumped Portland 81-52 in the regular-season finale to cap a 16-0 WCC campaign. The Zags were promoted to No. 1 in both major polls two days after beating the Pilots. The Zags won the WCC tournament and their NCAA tournament opener against Southern before falling to Wichita State. Gonzaga has steamrolled conference opponents this season by an average of 28 points, but blowouts are a rarity in the GU-BYU series. 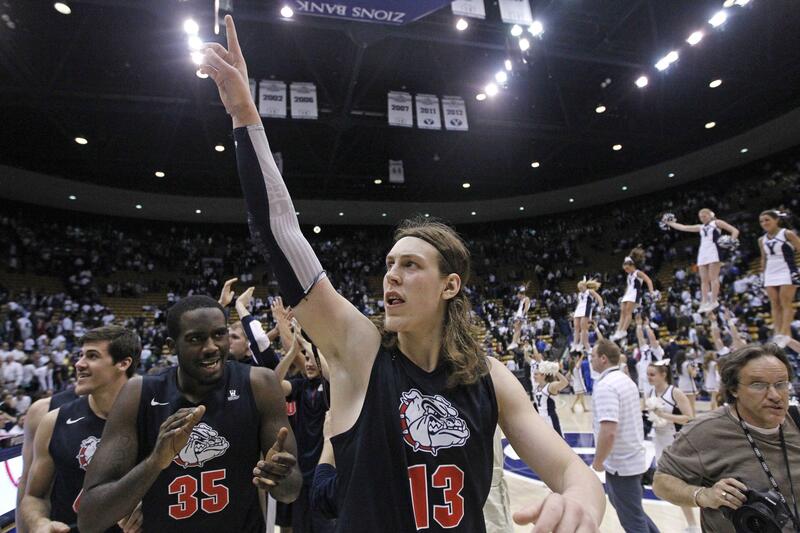 Gonzaga is 3-2 in the Marriott Center with all five games decided by 10 points or less. Published: Jan. 30, 2017, 10:01 p.m. Updated: Jan. 30, 2017, 10:17 p.m.